The RMA Geneva micro-scooter is a small wonder that combines some of the best features available today into such a compact and sturdy design. The Geneva has a large fully padded seat giving unparalleled comfort for a scooter of this size. 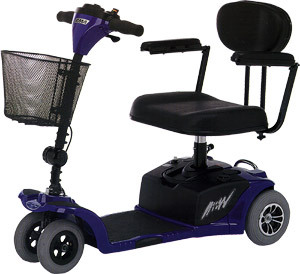 The combination of the patented swivelling front wheel design, fully adjustable tiller and the detachable battery pack make for an exceptionally versatile package that is ideal for transportation or use around shops.